Enter for a chance to win these two prizes! 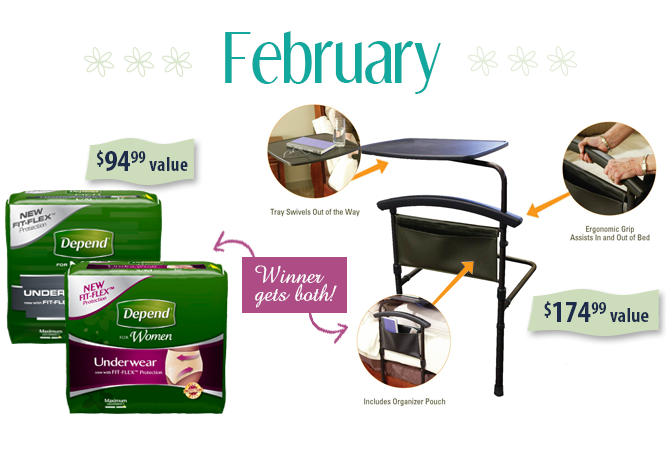 This month’s prize bundle from our “Helping You Get On With Life” sweepstakes includes a bedside tray with support handle to help a senior stay safe and independent at home, and a case of Depend pull-on underwear — a new choice in comfortable, discreet protection. These products are part of the solution to two big problems faced by our senior population today. Up to 40 percent of nursing home admissions are due to falls or fear of falling. And with millions of Americans affected by incontinence and new buyers spending an average of $130 or more just to find the right product, customers appreciate trial opportunities, which is also why we created our sample service. Independence Bed Table by Stander: 3-in-1 mobility tool is the ultimate bedside companion. Secure hand rail features an ergonomic grip for help getting in and out of bed. Bedside tray keeps item within easy reach and swivels out of the way when not in use. Organizer pouch holds reading materials, remote controls and other essentials. Easy-to-use design slides between mattresses for stability. This prize is valued at $174.99. Depend pull-on underwear with new FIT-FLEX™ protection: Easy-on/off, disposable underwear are soft, quiet and breathable like regular underwear, with more Lycra strands for a smooth, comfortable fit. FIT-FLEX™ is ideal for active people who need moderate to maximum incontinence protection but like a flexible fit that moves with them, especially in the leg area. Depend for Women is designed to fit a woman’s shape, with oval-cut leg openings and absorbent protection where it’s most needed. Depend for Men features snug, brief-like leg openings and protection up front where needed. One case contains 76 pairs and is valued at $94.99. The CareGiver Partnership created the “Get Back Into Life” monthly sweepstakes to raise awareness of products and services that help seniors live independently and make caregivers’ jobs easier. For a chance to win this month’s prize package, participants need only e-mail info@caregiverpartnership.com or mail a short statement explaining why the prize would be useful to him or her or a loved one. We will accept entries for this prize through Feb. 28, 2014, and will notify the drawing winner the first week of March. Visit The CareGiver Partnership to try sample products before buying, use the online Incontinence Product Finder tool, download a free fall prevention guide, and access more than 1,500 caregiver resource links and hundreds of free articles. To learn more about the two easy ways to enter and preview upcoming giveaways, visit our “Helping You Get On With Life” sweepstakes page.